It’s easy to get in the spirit of our nation’s biggest celebration July 4th. It takes just a little organizing for summer celebrations for us to have a grand ole time! 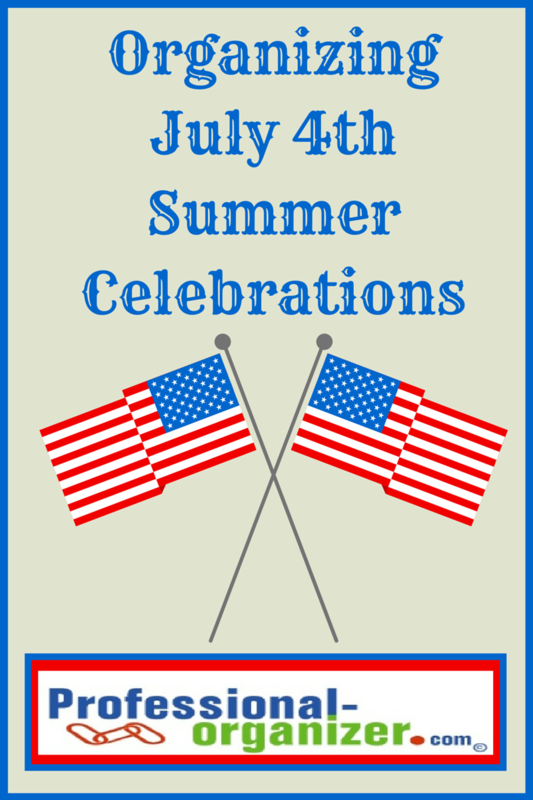 Organize July 4th summer celebration with these easy to do ideas. Easy to pull together, our patriotic colors set the stage for fun. Coordinate your party goods, food and beverages around these colors. Strawberries, blueberries, and watermelon are healthy additions to every celebration. Make homemade ice cream and add red, white and blue sprinkles. Guests love to be a part of the food preparation and are happy to bring pot luck items to share. Lanterns, twinkling lights, and sparklers bring light to your party after dark. While waiting for the fireworks, have on hand glow sticks, glowing necklaces and glow in the dark toys. Patriotic music is a must for this holiday celebration. Pandora has a special patriotic music station. Create your own playlist with God Bless the USA. Choose music from all generations to play throughout the day. Decorate your home with small flags at your curb. Place American flag toothpicks in your edibles. Share your patriotic spirit. Old fashioned games are the best! Think about croquet, frisbee, kick ball and other outdoor games we played as kids. Serve water infused with strawberries and basil while you are playing to keep hydrated. Bike rides and picnics are a fun way to celebrate the 4th too. Decorate your bike the evening before with red,white and blue streamers in your bike spokes and on your handle bars. Bring a picnic lunch with a red checked tablecloth. Rained out on your party date? Take the fun indoors with charades, Heads Up app on your smart phone, or a top 10 July 4th movie like Independence Day or National Treasure. Watch one of the national celebrations on tv from Washington DC or New York. Plan to pick up these items early in the week to stay away from holiday crowds. Enjoy your day with family and friends as you celebrate our national holiday. Let’s party! Ideas on pinterest. Many of us face the same clutter challenges. Questions like what to keep, how to keep it and how to get started organizing are some of the most frequently asked questions. These solutions can be simple ways to start decluttering and organizing your space. 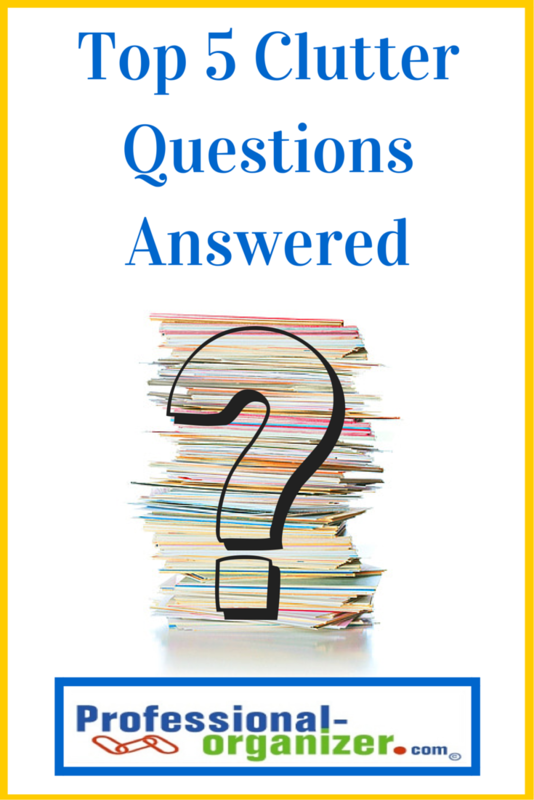 Check out these clutter questions and see if there is an answer for you here. I don’t know where to start organizing. You see clutter in many different spots in your home. You may wonder what’s the best place to start organizing. I suggest starting in one of these two ways. 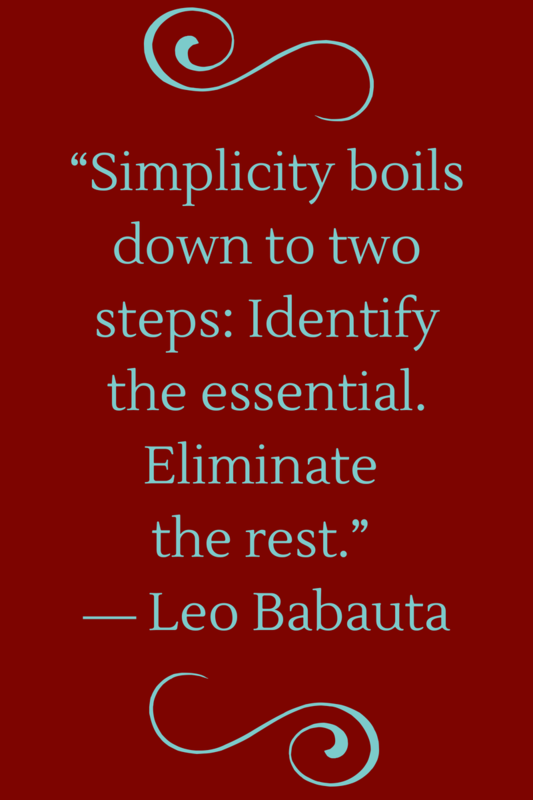 Start with what’s most frustrating. When you are frustrated, you are ready to make change happen. You are ready to let go of items and donate them. What’s most frustrating is most motivating. Start with a small space. It’s easy to get overwhelmed by organizing. By starting in small space, you are see the change you are creating. You can finish a project quickly because it takes only an hour or two to complete. Any space you start in is a great space! Start with just 15 minutes at a time and you will be amazed at how much you accomplish. I never have enough time to organize. Our lives are busy and full. It’s not always a top priority to organize and other activities take priority. There will seldom be a time we are truly ready to organize or have the time we want to do it all. Make an appointment with yourself (and those helping you) to organize. It can be as compelling as any appointment you make with a doctor, dentist or any professional. Your appointment will prevent other activities from being scheduled at the same time. Write in your calendar the time you will work. Work in baby steps. We often think organizing will take longer than we think. It fuels our procrastination. By working in 15 minute increments, with a timer, you can make a lot of progress. Make organizing a higher priority by thinking about your benefits. When you think about how your home or office will feel when you are organized, you will be more likely to get started organizing. 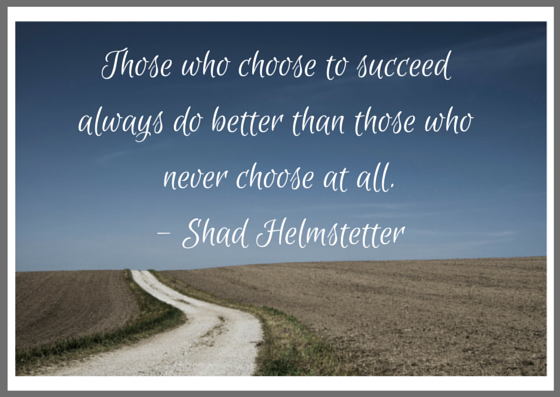 We’re not always partnered with those who view clutter the same way we do. However, we know that all relationships work best with respect and communication. Share and listen. Your family will want to make their home a serene environment. Set up small ways that organizing can happen on a regular basis. Most importantly, start with your own stuff first. When you model organizing, your family will follow your lead. We live in a world of vulnerability and unpredictability. It’s in our natural to want to keep more than we need as a result. There are a few antidotes to this thinking. The Minimalist share their theory of 20/20. Anything you can replace for 20 dollars or go out of your way 20 minutes to get can be eliminated. Anything you have not used in a certain number of years can be eliminated. You set that number of years. You may have to use it in the next 6 months, but it is worthy of storing as a result? You be the judge of which is more valuable to you. A little inconvenience or more added space. Share your story of why you are keeping an item. Does it make sense as you tell someone else? Just in case keeps us paralyzed. Check in with new perspectives to see if you are ready to let it go. It’s a gift from someone special. Unused wedding gifts, sweaters from sister’s that are too small, or a collection from a deceased family member can have a strong hold on us. Sentimental clutter is hard to let go of. Decide if it is something you love first. If not, let it go and let others be blessed by it. If it is, then here are more options. Is it an item that you can take a picture of to remember it, instead of keeping the item? Write a journal or blog post about why it’s special. Keep a few of the most precious items and sell the remainder. There are many ways to move forward with special gifts that have lost value for us. There are lots of decisions to make in organizing. There are lots of resources to use to help you. Check out my pinterest boards to find answers to your organizing questions. Join my monthly newsletter for more answers too. Family routines make family life run smoothly. It’s no secret there are lots of reasons to be an organized family. It’s these 8 routines that make a difference and help your family be THAT organized family. 1. Family meetings help everyone communicate, work together and know what is needed. 2. Grocery shop on the same day or days each week. Never run out of milk, bread or other essentials. 3. Your family calendar can be paper or digital. 4. Completing laundry twice a week means everyone can find their jeans and underwear all the time. 5. Have a landing strip where kids backpacks and your bags sit ready to go each morning. 6. Have a spot your mail comes to each day, open it over the recycling container and shred right away. 7. It could be just once a week, but having family dinner together makes for cohesiveness. 8. Everyone needs a good bedtime. Organized families keep up with habits and routines with charts, check lists and signs. 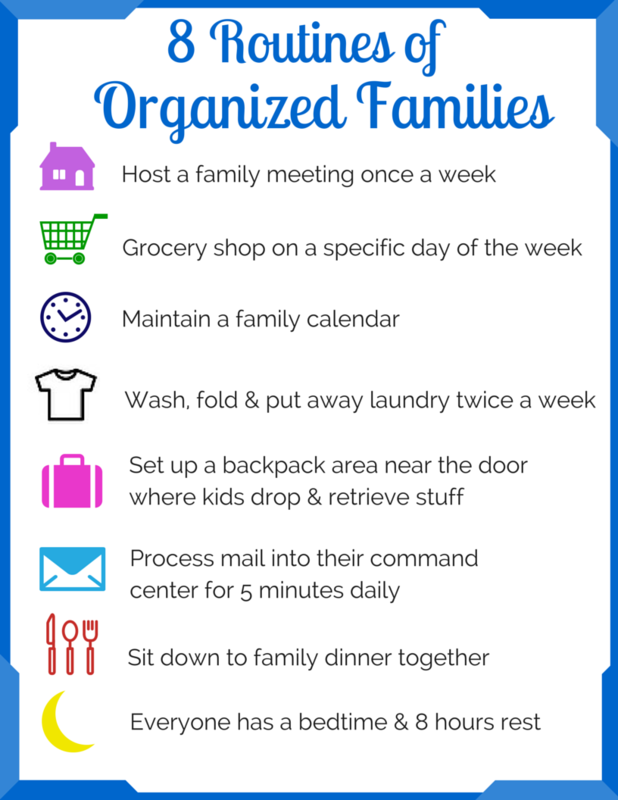 Organized families make time for organizing and prioritize working together to organize. Organized families know the value of organizing. More ideas for busy parents here!